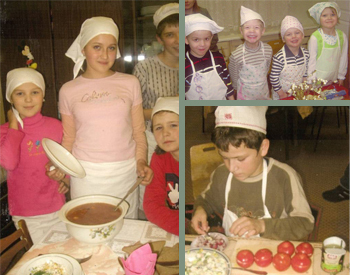 Friends of Russian Orphans helps expose children living in orphanages to basic family-living situations. Children living in orphanages are often not exposed to basic family-living situations. They need to learn life skills to survive since they usually have no family support system to help when they are released into the world. The goal of “What’s Cooking” is to encourage children to learn the skills of budgeting, shopping, meal preparation and household chores. Children are divided into teams and given an amount of money to use to prepare a meal, set tables, serve the food to judges and clean-up. The judges select a winning team to receive the prize of a dinner in a restaurant, where children learn about travel and social skills.